Yet another fan material from Ajith. He has tried to luxuriate in his role but the negligent screenplay lets his efforts down. A mildly entertaining first half. A lousy, over-the-top second half. Ganesh (Ajith) and his sister Tamizh (Lakshmi Menon) come to Kolkata to pursue her education. He works as a taxi driver and one occasion he helps the cop to catch a key member of the underworld. As a result, he is now being wanted by the villains. The story gets a twist when it is realised that he is in Kolkata to catch the baddies. What happens next is the interesting part of the story. The story lacks freshness and it is predictable at parts. But one can ignore the logics for the sake of entertainment. The comedy in the first half does not work and there are some sloppy scenes. Ajith is the show stealer in "Vedalam". Ajith carries this film on his shoulders, for the film is largely cliched and has a poor plot. Thala shines throughout with his dialogue delivery, different shades of performances and terrific screen presence. Kabir Singh Duhan deserves a special mention as he is the most convincing villain among two others. His expression of anger and vengeance is something to watch out for. While Lakshmi Menon has bagged an important role for which she has done complete justice to. Thambi Ramaiah impresses as a blind father, this role be a good come back for him from the worst role of ‘Puli’. 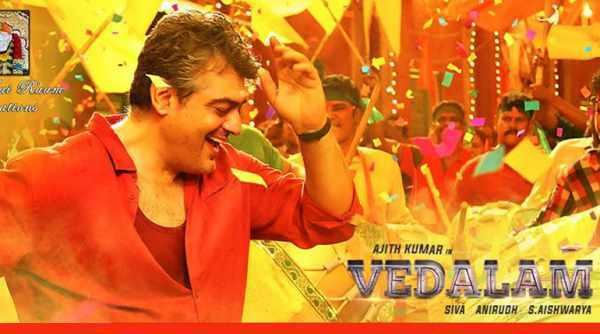 Comedy sequences work seldom in Vedalam and is one of the major drawbacks of this film. While Soori fails to evoke laughter, Shruti Haasan deserves a praise for taking up this role and that's about it. Though the first half takes its time to take off, the way it ends is one of the highlights of Vedalam. Second half though is largely saved by Ajith which otherwise has nothing new to offer; a few melodramatic scenes and tons of brother-sister sentiment to name a few. Vetri's cinematography adds value to the film. His angles are refreshing and images nice and sleek. Though Ruben's editing is above average, he would have reduced the overall length of this film that would've made it racier. Anirudh's background score is over the top and gets irritating at places. All stunt sequences are choreographed well by Stunt Silva and is a treat to watch. ‘Vedalam’, a typical tamil movie, nothing offering new just a feel good, commercial, festival family entertainer. Sure to attract women and families.